Come enjoy the quiet and secluded end of Martha's Vineyard, Aquinnah (formerly called Gay Head), to stay in a comfortable family home with two queen beds, 3 twin beds, and 1 bunk bed, two full baths, and outdoor shower. Kitchen opens to LR, DR area. Wireless internet access and cable TV. Relax on the large open deck with beautiful views north across Vineyard Sound to the Elizabeth Islands and Buzzards Bay, or on the screened porch toward small lily pond and woods. 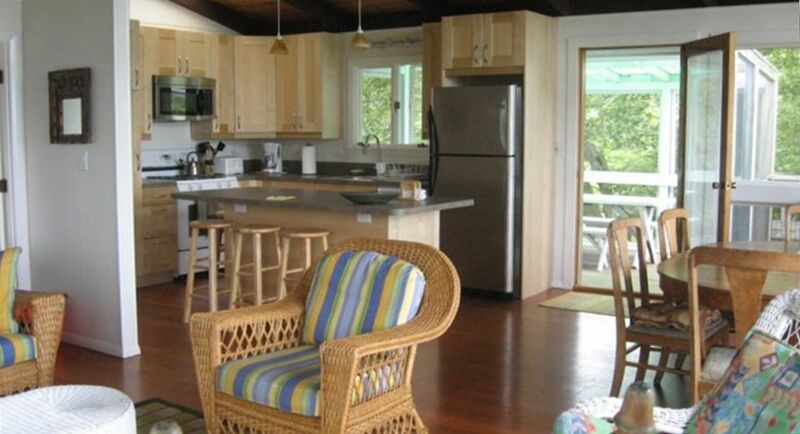 This house is a short drive to Philbin Beach - one of the best ocean beaches on the east coast. Child-friendly Vineyard Sound-side beaches easily reachable by bike or on foot. On a quiet country road, adjacent to conservation land, this is the perfect spot for biking, hiking, sailing, fishing, or just relaxing by the seaside. Visit the world-famous Gay Head cliffs and lighthouse or go a little farther to sample the many delights that make Martha's Vineyard such a popular destination. The house is at the end of an unpaved road (1/3-mile long). From the paved road (Lobsterville Road) it's a 10-minute walk to the Vineyard Sound beach (which you can see from the house). The ocean-side beach (Philbin Beach) is a 12-minute car ride from the house. There is also a beach at Menemsha Pond, a short bike ride (or car ride) from our house. Our end of the island is very quiet and very safe and beautiful for bicycle riding. There's a little bike ferry that crosses in 5 minutes to Menemsha, the fishing village. Upper level: LR/DR/kitchen area (open plan), master bedroom (queen bed), full bathroom. Off the LR side there is an open deck; off the DR side there's a smaller open deck (where there is a barbecue grill), and a screened-in eating porch. Lower level: 3 bedrooms ( Queen, Two Twins, Bunk + One Twin) and a sitting/den area. There is also a full bathroom downstairs and a laundry room. Of course there's an outdoor shower as well. 2 brand new updated bathrooms (upstairs has tub shower, downstairs has shower). There is also a spacious outdoor shower. Beautiful views, relaxing home, great kitchen! We enjoyed our stay at 6 Beach Rose Way! The house was roomy enough but the benches, two decks, screened in porch and hammocks allowed for my family to find a private area to read or relax . It was our first time staying in Aquinnah but it won’t be our last! Absolutely lovely place to stay! We loved our visit and stay at this house on the Vineyard. Beautiful views, morning light and breezy home close to the beach. This house was amazing. It suited our needs perfectly. I wanted an up island rental with views of the ocean that could provide lots of living space and outdoor space for my family. The great room was very open and bright with stunning water views and nice breezes. The updated kitchen had everything you needed to cook with and to entertain with - just fabulous. The screened in porch was great for dining outside but not dealing with bugs. The Master bedroom was bright and cheery with a very nice bed. Actually, all the beds were terrific. 3 of the 4 bedrooms on bottom floor were cozy but very charming and were perfect for sleeping/hanging out. The queen bed room on bottom floor was a very nice size and had a great bed as well. Laundry room was super handy and the home supplied plenty of linens, towels and extra blankets. The den on bottom floor was a great hang out spot for my kids and visiting family who came to hang on some nights. Really, there was space for everyone. I must not forget the awesome outside shower - so perfect after a day at the beach and the water pressure was great. The home is off a long dirt road but we were still able to ride our bikes from the house to the main roads. The access to Lobsterville Beach and Mememsha was terrific and of course Philbin Beach and the lighthouse and cliffs. We had family in Chilmark and so this house was a perfect location. The owner, Barbara and her caretaker for her home were a delight to work with. What a wonderful week we had in this very special home. We're so glad you liked the house, and for many of the same reasons we do. We will consider pets with minimum of two weeks' stay, and for additional damage deposit (to be negotiated). 50% payment by check with signing of lease; remaining 50% plus damage deposit due 4 weeks before occupancy; all deposits are non-refundable.